NOTE: Mass air flow sensor is removable under the car-mounted condition. Remove air cleaner filter. Refer to EM-16, "Removal and Installation". Remove air duct assembly from air cleaner case (lower). Remove air cleaner case (lower). Disconnect harness connector from mass air flow sensor. Remove air cleaner case (upper). Remove mass air flow sensor from air cleaner case (upper) (if necessary). Separate air cleaner case duct from air cleaner case (lower) and air duct assembly. Remove air duct from air duct assembly and resonator. 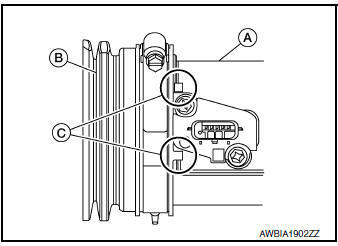 Align mating marks (C) of air duct assembly (B) with air cleaner case (upper) (A) as shown. 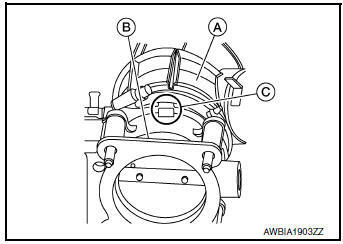 Align mating marks (C) of air duct assembly (A) with electric throttle control actuator (B) as shown. Inspect air duct and resonator assembly for cracks or tears. If anything found, replace air duct and resonator assembly.